With a 4-2 victory over the New York Rangers on Tuesday night, the Ottawa Senators punched their ticket to the Eastern Conference Final. They won their best of seven series 4-2, sealing the deal at Madison Square Garden. The Senators will face the winner of the Washington Capitals/Pittsburgh Penguins series, which will see Game Seven on Wednesday night. Ottawa hasn’t seen a conference final since 2007, when they faced and defeated the Buffalo Sabres in five games. 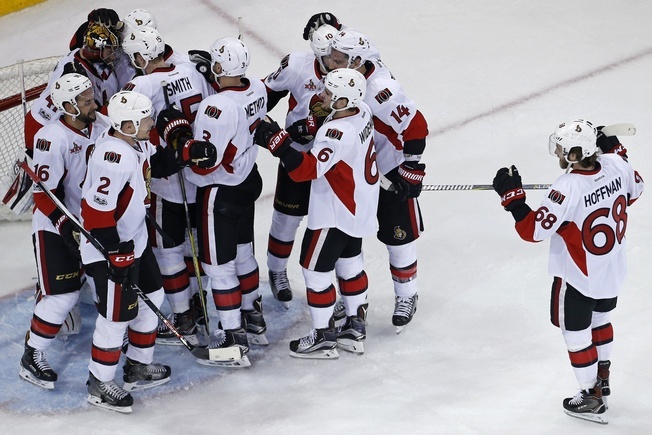 The Senators moved on to face the Anaheim Ducks in the Stanley Cup Final but lost in fie games. Erik Karlsson, Mike Hoffman, Mark Stone, and Jean-Gabriel Pageau had goals for the Senators on Tuesday, while Mika Zibanejad and Chris Kreider scored for the Rangers. Henrik Lundqvist made 22 saves for New York, while Craig Anderson made 37 saves in the win. Lundqvist had previously won 10 of 11 home games when the Rangers faced elimination, but it was not to be this time out and he’s now seen his season end on home ice two years in a row. The Senators made the most of their chances and scored the first goal of the game, marking the first time in the series they accomplished the feat. The Rangers were pressing in the first period, though, and Anderson was tested. He made 13 saves in the first frame alone. The Senators played a complete team game when it mattered, but it was Karlsson who led the way. He played incredible hockey in Game Five and Game Six, driving the action from his own end and propelling the offensive play without losing any defensive footing. Ottawa held built an impressive defensive structure behind coach Guy Boucher, but they had the offensive edge against New York and made it count.